August 23, 2012, 2:09 PM · Here's a performer who brings a sense of assurance and enjoyment to his audience, not to mention masterful playing -- that was what I thought when I first heard Benjamin Beilman perform live during the 2010 International Violin Competition of Indianapolis. 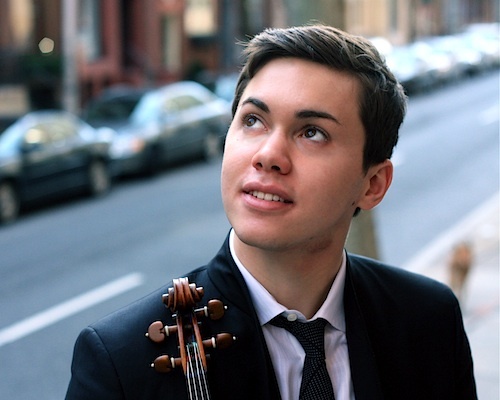 Just three months before that performance, Benjamin Beilman had won first prize at the Montreal International Music Competition, and he won the Bronze Medal at Indianapolis. Two years later, Beilman, 22, has graduated from Curtis Institute and also received a 2012 Avery Fisher Career Grant and a 2012 London Music Masters Award. This fall, Benjamin has a busy season with performance engagements all over the world: a recital September 7 in Cold Spring Harbor, NY; a performance of the Mendelssohn Violin Concerto Sept. 14 in Switzerland with conductor Sir Neville Marriner and the Zurich Tonhalle Orchestra; a performance at New York's Alice Tully Hall on Sept. 24, playing Kodály's Serenade for 2 Violins and Viola, Op. 12, with violinist Ani Kavafian and violist Paul Neubauer; and on Oct. 20, his Wigmore Hall debut, a recital with pianist Yekwon Sunwoo, as part of his London Music Masters Award. Benjamin spoke to me over the phone from Philadelphia last month about how he juggled long-distance violin studies with the Vamoses at the Music Institute of Chicago during high school, about his time at Curtis Institute, about coping with the rigors of the competition circuit, and about being one of the first violinists after Hilary Hahn to play the Pulitzer Prize-winning 2008 Violin Concerto by composer Jennifer Higdon. Laurie: How did you get your start, playing the violin? Ben: I first started playing violin in Houston, with a Suzuki teacher. My sister, who is two years older than me, had started violin when she was five, so by the time I was five I wanted to play as well. Shortly after I started taking lessons, we moved to Atlanta, and I studied with a former Atlanta Symphony player. We lived there for five years, then when I was ten, we moved to Chicago. A lot of moves! Three years later we moved up to Ann Arbor (Michigan), where I went to high school. While living in Ann Arbor, I was actually studying with Almita and Roland Vamos in Chicago. My dad and I would leave after school on Friday -- it takes about four and a half hours to get from Ann Arbor to Chicago. We'd get there in time for the performance class Friday evening. The performances classes are kind of legendary for running until two or three in the morning. Then I'd have lessons all day on Saturday; I'd play in the little string orchestra that the Vamoses had assembled, and then Saturday night my dad and I would drive back to Ann Arbor and spend the rest of the weekend there. Laurie: That's dedication! So, you studied with the "Vami" -- I understand that they often work together with a student. Ben: Usually, yes. They like teaching in tandem, especially in their pre-college unofficial program. Typically, Mr. Vamos really focuses on technical aspects: etudes, Sevcik, Paganini Caprices, Locatelli, Dont -- all those kind of things. Mrs. Vamos usually hears the standard repertoire pieces. Laurie: What a nice combination. I graduated high school a year early because I was so eager to start at Curtis. I had originally wanted to audition at Curtis a year earlier, after my sophomore year of high school. But my mom wisely, wisely put her foot down and said, 'No. You should have as much time being a normal kid as possible, and then when you go to Curtis you can use all that time to focus on music.' You don't want to have a couple years of high school (requirements) lingering, because then it's just going to complicate things. So I went to Curtis when I was 17, and I studied primarily with Ida Kavafian for the first four years. Curtis allows, and almost encourages, students to stay a fifth year during the Bachelor's program. There are so many opportunities at Curtis to take advantage of that it's hard to do that in four years. So in my fifth year at Curtis, I added Pam Frank as a teacher. Curtis also encourages that kind of sharing of students. Even before I officially started studying privately with Pam, I worked a lot with her in chamber music, on sonatas -- So I had worked with both of them for a long time. Laurie: You have done a lot of competitions, and I was curious about what you've learned from that process -- about preparation, about performance, about yourself. They seem very grueling! Ben: They can be -- especially the bigger ones that I most recently have competed in, the Montreal and Indianapolis Competitions. Those are the only ones of that magnitude that I've done, on the international circuit. Before that, I was doing a lot of national competitions. Those are still very high pressure, but not as grueling as a two-week-long competition. In general, you learn to accept that it may not be your day, at all times. You have to focus on what you're getting out of the competition, regardless of the winners. My teachers really emphasized the idea that a competition is for you to get a lot out of just practicing for it. You have that deadline, you have that big date marked off on your calendar. You know that by that date, you need to have a huge list of repertoire -- the Brahms Concerto, Bach's B minor Partita, Ravel Sonata, whatever it is -- ready to go. In my early years, the main thing I got out of competitions was just having to balance a lot of pieces at once like that. But in the bigger competitions, Indianapolis in particular, I remember thinking, even before the final round came: How am I going to do this? I am just so tired, I feel like I've given it my all. Even though you only play three or four rounds, it feels like every day you are competing. You are always in the competition mindset. You have very limited time with the pianist so you always have to be on for that, you have to be ready for the meetings with the conductors or with the orchestra -- you're constantly going at 120 percent. And that's going for 17 days, in some cases. Laurie: That's a long time to sustain that. Laurie: You must feel like a completely wrung-out towel by then. But I suppose it prepares you for the life of a soloist. Ben: Absolutely. Looking back, everything else after that will seem that much easier. When you have to go play Bruch Concerto and then play Sibelius and Brahms in a two weeks' span of time, you think, okay, I've done this before, this isn't my first time. Laurie: I think it's really neat you have this musical relationship with your Curtis colleague Chris Rogerson, and I wondered if you could tell me how that started and how you've worked together with this composer. Ben: We first met at a workshop sponsored by the National Foundation for Advancement of the Arts, called Young Arts. They hold this weeklong seminar for artists of all disciplines who are seniors in high school. They have writers, they have dancers, they have singers both classical and popular, instrumentalists, jazz….they have all arts included. It's sort of a competition, but more than anything, it's supposed to introduce you to all these different disciplines. Chris and I met there, obviously he was a composer and I was a violinist there. Then when I came to Curtis, he had been a student there for two years before me. So we started hanging out a lot and became friends. Benjamin Beilman - Lullaby from ARTISTIC AGITATORS on Vimeo. I very quickly took to his musical language and general approach, and it was something I really enjoyed working on and playing for eight or nine performances. Then, serendipitously, both of us joined the Young Concert Artists roster -- he joined about a year before me. I talked with my managers there and asked if they'd be willing to help me commission Chris for a violin sonata to play for all of these very important debuts that I had coming up last year, at the Kennedy Center, in New York and just around the country. They went for it, and so he and I got to work together again. He's a close friend. He's a Michigan football fan, so we'd watch football games together outside of music, we'd hang out, we'd go to parties together. So it was kind of the best of all worlds. One of the best things for me about commissioning a piece is how much influence you can have on it. Obviously, you're not dictating everything, but you can give the composer ideas. For example, let's say you have a Schumann sonata or something on the program that's very dark: you can suggest writing a piece that would contrast that, or maybe a series of little vignette pieces that are lighter in character. Or, you can say, 'I want you to listen to the way Debussy treats violin and piano in the Debussy Sonata, because I like that idea.' It's cool, helping to frame these new pieces. Laurie: I understand that you recently performed the violin concerto by Jennifer Higdon with the South Dakota and Glens Falls symphonies. That concerto is a pretty new baby isn't it? Isn't that the concerto that Hilary Hahn commissioned? Ben: Exactly. That was a really cool process. Hilary commissioned Jennifer, with the help of the Baltimore, Indianapolis and Toronto symphony orchestras. The piece was written for Hilary, and Jennifer had Hilary' playing style and technique in mind. The piece was originally workshopped with the Curtis Orchestra, so that both Hilary and Jennifer could hear what it sounded like, how things fit, how things were balanced. At the time, I was sitting in the first violin section of the Curtis Orchestra, experiencing all this. I had no idea that I would eventually be playing the piece as well! It was fascinating to see the logic and the whole process of a soloist going about the question of: How do I make a piece perfect, for myself? For example, I got to see, in the second movement, how Hilary didn't like how some of the trombones were balanced, and so some of those things were edited out. Some things were added in, as well. I also was in the orchestra when Hilary performed it with the Curtis Orchestra at Carnegie. After that, I started working on it with Jennifer, so I got to see up close, how Hilary maneuvered around these things. Just as a little side note: Jennifer would send Hilary drafts of the movements and I guess it was three or four times, Hilary sent it back saying, 'No, this needs to be harder. Make it harder, make it harder.' So you could imagine, if someone like Hilary is asking for something to be more technically challenging, it's going to be impossible to play! Laurie: And so was it? Ben: Sometimes, yes! Again, Hilary was so nice. She gave me her personal fingerings and recordings, so I had kind of a leg up on tackling the piece. Laurie: Did you meet with her in person or anything? Ben: I did, I asked her about a couple of fingerings and sections, and she also gave me really great advice about how to prepare it with the orchestra: certain things to focus on at each rehearsal. You have three full rehearsals with the orchestra, and the first time you meet with them, you don't do any rubato obviously, you just get it so they can feel the rhythms out, feel the pacing, and just kind of how to work with the orchestra, which obviously she is so skilled at. So it was great. I couldn't have gotten it from any better source. I had private sessions with Jennifer as well, so I had all I could possibly get. August 24, 2012 at 07:21 AM · A fantastic interview with a young man who already has a beautiful perspective! Very much looking forward to hearing him live, and of course, Laurie, KEEP UP THE GREAT WORK! August 24, 2012 at 12:40 PM · Very interesting piece on an emerging artist. One aspect that interested me was the interaction between Hahn and Higdon about the solo part with Hahn telling Higdon to make it harder. We've come a long way from Joachim telling Brahms why certain aspects of his violin concerto were unplayable. August 24, 2012 at 02:17 PM · A little like Heifetz and Walton, actually! I thought of that dynamic while reading this. August 27, 2012 at 03:17 PM · Wonderful player - I remember many of his performances at the ENCORE summer festival. August 27, 2012 at 04:40 PM · Wonderful young musician ! I wonder what kind of violin he performs on. August 27, 2012 at 07:11 PM · I, too, would like to know what fiddle he plays. August 28, 2012 at 06:19 PM · Laurie said I won his Prokofiev CD in the contest! Oh, I can't wait to play it. I never thought I would win something. This makes me feel so happy.